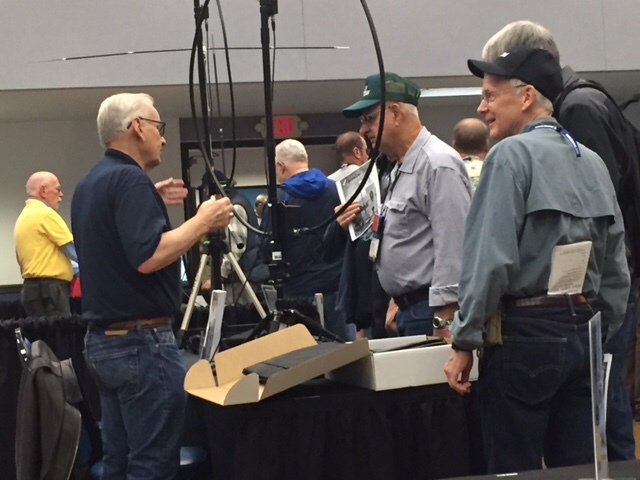 New Loop Antenna was a big Hit at SEA-PAC ham radio show. Eric Swartz WA6HHQ of Elecraft, is shown using our new Precise LOOP antenna in his booth. Eric was our very first Loop customer. He was very impressed with our loop and sent a number of customers our way. 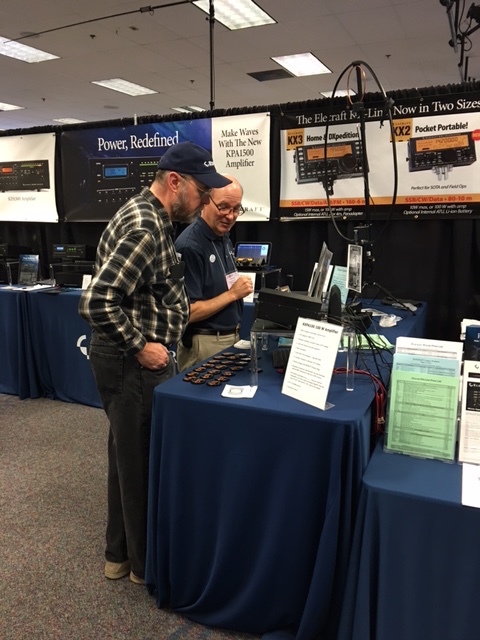 Here Roger Stenbock W1RMS, is explaining the unique loop benefits and performance to some of the many hams stopping by our booth. The 45W higher power and 80 Meter option, available on the Precise LOOP High Gain model, was of particular interest to those wishing to operate at field day and HOA limited QTH locations. The PG50PS was really well received and we sold a number to hams and home brew engineers. We received a lot of interest right away, some inquiries were from as far as Australia. The introductory and show price was $450. As soon as we get back to the office, we will update our website to make it available at the show price for a limited time directly online. In the meantime, here is some additional information: PG50PS-datasheet2.pdf. Roger, I was one of the ones that saw your new loops at Sea-Pac, debated too long and they sold out! Of course I looked at other vendors too and I wonder if you could comment/compare to the Alpha Loop who had a booth at Sea-Pac also? You have comparisons to a couple others in your data sheet, however for loops right now I am looking at your product vs Alpha which has been on the market for awhile. Any test data on your loop showing performance from 10-80? I heard one comment that no way a small loop could work on all those bands? I am mostly a portable/SOTA operator, however would like something I could use at home too and am considering the High Gain model even though it isn’t quite as small for using both portable and at home. Thank you for your question. It is true that loop antennas are small and can suffer from losses. The preciseLOOP was designed to minimise these losses. There are only two components in the radiation loop – the inductor loop and the tuning capacitor. By matching a low loss, air variable dual stator capacitor to a large surface area radiation loop, the losses can be reduced to a minimum. By measuring the RF current (the current that matters) in the radiation loop and maximising the efficiency is actually quite good in the precuseLOOP high gain version. I am preparing an application note featuring Magnetic Loop Antennas (MLA) to explain this further. I plan on publishing soon.